It would be tempting to call Kevin Armstrong the ultimate ‘nearly man’ of 1980s pop – he nearly joined a post-Johnny-Marr Smiths, was nearly a founder member of David Bowie’s Tin Machine, nearly joined Level 42 Mark II, and nearly became Paul McCartney’s right-hand man during the ex-Beatle’s late-decade renaissance. But that would be unfair on the guitarist; as well as stellar work with Bowie (Live Aid, ‘Absolute Beginners’, ‘Dancing In The Streets’) and Iggy Pop (Blah-Blah-Blah, countless world tours), he has also contributed to classic albums by Prefab Sprout, Thomas Dolby and Morrissey and performed live with Roy Orbison, Sinead O’Connor, Grace Jones, Propaganda and PiL. This entertaining Pizza Express show was half wonderfully-indiscreet spoken-word memoir and half gig. Decked out in all-black rock-star garb, Armstrong described his initiation into the music world via an obsession with Zappa’s ‘Black Napkins’ and postal-order guitar handbooks, and lamented the current pop scene as ‘just another part of consumer culture’. He spoke of one life-changing morning in early 1985 when he received the call from legendary EMI A&R man Hugh Stanley-Clarke: an invitation to Abbey Road to record with ‘Mr X’. Arriving at the famous address, Armstrong was shown upstairs to a tiny demo studio (not the big Beatles-frequenting Studio 1 downstairs) to find a bunch of session players and a smiling, suited Bowie holding an omnichord and uttering the totally superfluous ‘Hi, I’m David!’. Bowie then proceeded to teach the band a song called ‘That’s Motivation’ (from the ‘Absolute Beginners’ soundtrack) two bars at a time – and they then recorded it that way too! A few days later, Bowie summoned Armstrong to Westside Studios near Ladbroke Grove for the ‘Absolute Beginners’ and ‘Dancing In The Street’ recordings (the former with vocals by Armstrong’s sister, then working behind the till at Dorothy Perkins, responding to Bowie’s request for a ‘shopgirl’ to sing duet with him!). The latter session was of course graced by an absurdly perky Mick Jagger. 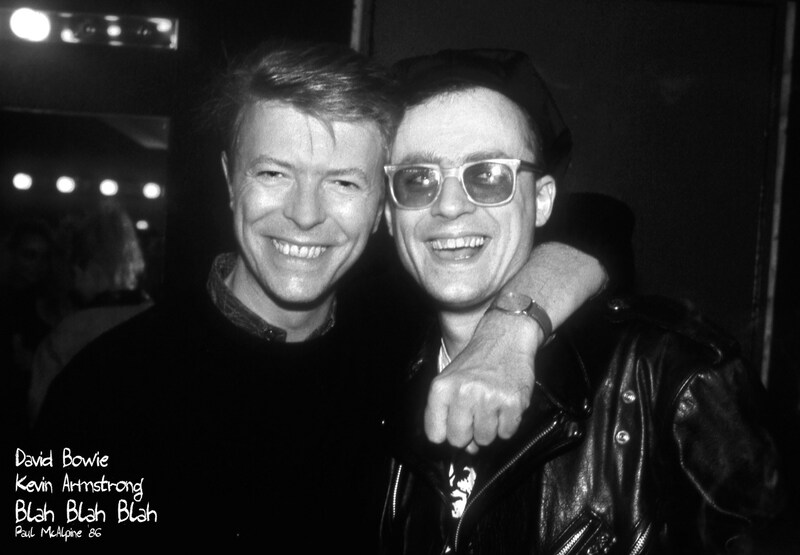 Apparently Bowie and Jagger spent most of the vocal sessions shouting ‘Let’s ring Maureen!’, their nickname for Elton John. Armstrong then told great tales of Live Aid, mainly highlighting Bowie’s incredible generosity: fluffing the names of backing vocalists Helena Springs and Tessa Niles during his onstage band introductions (no other solo artist introduced his/her band on the day), according to Armstrong he immediately apologised profusely to the singers as soon as they were offstage. In the second half, Armstrong was joined by Iggy bandmates Ben Ellis on bass and Matt Hector on drums to perform songs that he’d played live with all the aforementioned stars. Efficiently sung and superbly played, it was nevertheless a somewhat humourless set of music that only served to emphasise the difference between a perennial sessionman and born headliner. But this was still a hugely enjoyable evening, foregrounding a time when music really was transformative. We await Armstrong’s forthcoming memoir with great anticipation. As we’ve said before, the 1980s produced some fine lyricists. You couldn’t move for decent wordsmithery. But interesting lyrics came from the damndest places. What was that Trevor Horn maxim? A good pop song should be like a good story, such that the listener is always asking: what’s going to happen next? And, like a good story, pretty much every good song starts with an intriguing opening line or two. As the proverbial cigar-munching music-biz mogul might say: ‘You gotta grab ’em from the first bar, kid…’ So here are some great opening lines from 1980s songs, lines that hopefully satisfy Horn’s requirements. Whistle Test: Best Of The 1980s? What a treat to watch a special live edition of ‘The Old Grey Whistle Test’ on BBC Four the other night (UK readers can watch it again here until 23rd March). The excellent Bob Harris returned to present – but where was Annie Nightingale? We saw a bit of her in her ’80s presenting pomp, but sadly she wasn’t in the studio. The special reminisced unashamedly about a time when the musicians ran the music biz, and also documented the fascinating history of music TV with an interesting mix of guests (Joan Armatrading, Toyah, Chris Difford, Ian Anderson, Dave Stewart, Danny Baker) and live performances (Kiki Dee, Gary Numan, Albert Lee, Peter Frampton, Richard Thompson). Not exactly a cutting-edge, youthful lineup, but the musicianship was at an exceptionally high level. Maybe a less than brilliant song but Annie’s vocals and stage presence are spellbinding. And I like the flute interlude. Also look out for an amusing cameo from Holger Czukay, who creeps onstage (to Annie’s annoyance?) like Banquo’s ghost. One of the first things I saw on the show. A tender reading of a classic song. Fascinating mini feature about Joni’s painting, ostensibly to promote her album Dog Eat Dog. One that has only come to light recently, but I would have been blown away by it had I seen it at the time. A special mention for man-of-the-match John Beck on keys. The ex-Simple Minds rhythm section (Derek Forbes and Brian McGee) are cooking on this ZTT classic, as is Bowie/Iggy/Prefab guitarist Kevin Armstrong. Chiefly remembered for a great two-guitar frontline (John McGeoch and Lu Edmonds) but I was also fascinated by John Lydon’s red headphones and suit. One of the more illuminating interviews about So plus an interesting solo version of ‘Red Rain’. Another corker that’s come to light recently, unfortunately shorn of its witty Annie Nightingale intro here. Pity poor Adrian Belew – Fripp’s gaze hardly moves from him throughout. I missed the recent 30th anniversary of Raintown probably because I was surprised it was originally released as early as 1st May 1987. A famous ‘sleeper’ record, it eventually crawled up to #14 in the UK album charts but remained in the top 100 for 18 months off the back of some single re-releases and constant touring. Raintown is pop, not rock. The album positively sparkles. James Prime’s excellent keyboard playing is prominent (they didn’t really need a guitarist at this point) with his ‘mystery’ chord very recognisable (later also heard on ‘Real Gone Kid’ and ‘Love And Regret’). Vocalist Lorraine McIntosh emerges as a kind of ‘bluesier’ version of Prefab’s Wendy Smith though she certainly divides opinion – she nearly ruins the title track and superb ‘Love’s Great Fears’ but is very effective when reining it in on ‘Loaded’ and ‘Dignity’. There aren’t many more evocative ’80s album openers than the brief ‘Born In A Storm’, a gorgeous mood piece which sounds a bit like The Blue Nile if they knew a few more chords. ‘Loaded’ is a classic song ‘about some of the people we’d met in the record business’, in Ross’s words. His gritty vocals really work on this – he sounds positively distraught by the last few choruses – and the modulation at 2:48 is one of the great moments of late-’80s pop. ‘When Will You Make My Phone Ring’ is also memorable, even if Ross struggles a little with the lead vocal and the whole thing is a little similar to the soul standard ‘If You Don’t Know Me By Now’. The excellent ‘Chocolate Girl’ – influenced by Prefab’s ‘Cruel’ in its portrait of a modern relationship – features some gorgeous BJ Cole pedal steel and a few classic couplets including: ‘He calls her the chocolate girl/Cos he thinks she melts when he touches her’. Finally, Raintown is a romantic album about work, home, love and nostalgia which probably gives a lot of people (including me) a warm glow when they hear it. I couldn’t get with the band’s later rockier direction but I’ll always have a soft spot for this one. A cursory survey of Dolby’s musical career reveals that he’s a pivotal figure by any standards, collaborating with Prefab Sprout, Stevie Wonder, Eddie Van Halen, Jerry Garcia, George Clinton, Herbie Hancock, Trevor Horn, David Bowie, Def Leppard, Joni Mitchell… And that’s not even factoring in the excellent solo albums and technological innovations (he created the software for the first popular mobile ringtones). So if it’s pithy, musicianly anecdotes and the bittersweet memories of an Englishman (mostly) abroad you’re after, his enjoyable autobiography ‘The Speed Of Sound’ certainly does the business. But, as we’ll see, it’s very much a book of two halves. A music-and-technology-mad teenager, Thomas Morgan Robertson first builds up his performing chops during a lengthy period of busking in Paris, finding out quickly that playing ‘Stairway To Heaven’ is the only way to make any money. Returning to London, he’s in the right place at exactly the right time and on the verge of launching his solo career when summoned across the pond to work on Foreigner 4. Christened ‘Booker T Boofin’ by the AOR legends for his considerable efforts, it nonetheless turns out to be a not entirely edifying entrée into the world of mega-bucks recording. We get the inside story of his appearance with David Bowie’s at Live Aid (with only three short rehearsals), hear about a hilarious fishing trip with George Clinton and a memorable serenading by Stevie Wonder in a studio broom cupboard. Then there’s an enjoyable detour into the world of movie soundtracks, ‘hanging out’ with George Lucas and meeting the love of his life in LA. By the early ’90s, we’re deep in ‘Spinal Tap’ territory when Dolby has amusingly mystifying dealings Eddie Van Halen and Jerry Garcia. So far so good. But the second half of ‘Speed Of Sound’ focuses on Dolby’s lengthy sojourn in Silicon Valley. Depending on your taste, this will either be a trial or treat. I skipped large chunks of it. I wanted a lot more music and a lot less tech, and you sometimes get the feeling Dolby did too throughout that period (he frequently laments the fact that his more ‘personal’ music on Aliens Ate My Buick and Astronauts & Heretics failed to find an audience). The other issue – hardly Dolby’s fault of course – is that everyone seems to be writing a memoir these days and it only emphasises the dearth of decent recent music. And slightly lessens the mystique of the best ’80s material. I’d trade one more decent Dolby solo album for any number of ‘Speed Of Sound’s… But it’s still an enjoyable read. ‘The Speed Of Sound’ is published now by Icon Books. Thomas discusses writing the book here. Much more on Thomas’s music career here. Many happy returns to a modern master, still Sproutin’ after all these years.